Shoes: check. Dress: check. Jewelry: check. Veil: check (hopefully after this). That’s right, today is all about the finishing touch on your wedding day look. Whether you’re wearing lace, a cute birdcage, a short flyaway, or a stunning blusher, you’re sure to be beautiful. Length and material (of both your dress and your veil) are always important when considering which headpiece to go with, as are adornments and hair-do. Stay true to you, maintain your style and your inner beauty. Your wedding day is all yours: all your style, all your colors, all of your loved ones, so no matter your decision, I'm sure you'll be breathtaking. While veils are by no means a necessity, this is just a taste of the beauty you could add to your look. 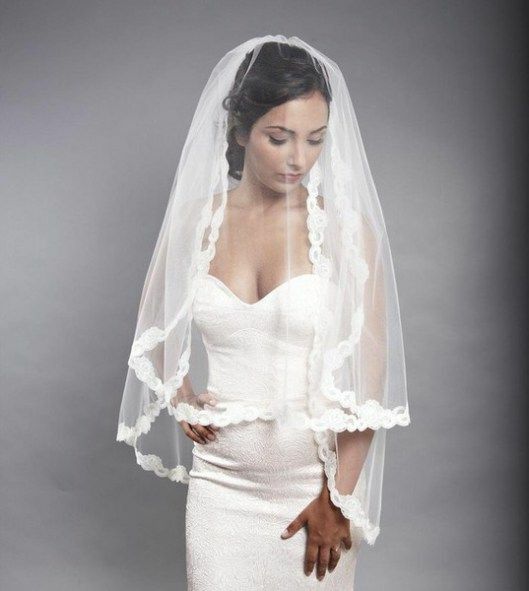 Long, short, blushing, scalloped, or caged, veils are a finishing touch that gives you that "once in a lifetime" feel.